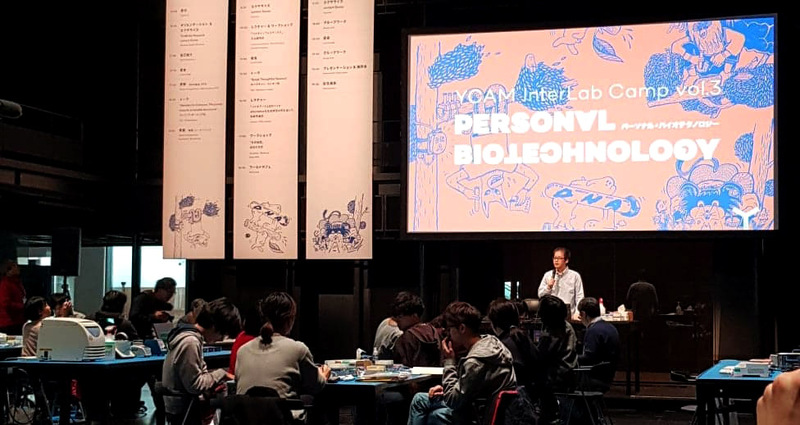 This month I was fortunate to be invited to Yamaguchi in Japan, to take part in YCAM’s Interlab Camp: Personal Biotechnology. YCAM, or Yamaguchi Centre for Arts and Media / 山口情報芸術センター, is an amazing media arts center with exhibition spaces, a theatre, workshop spaces, and even a biotechnology lab. 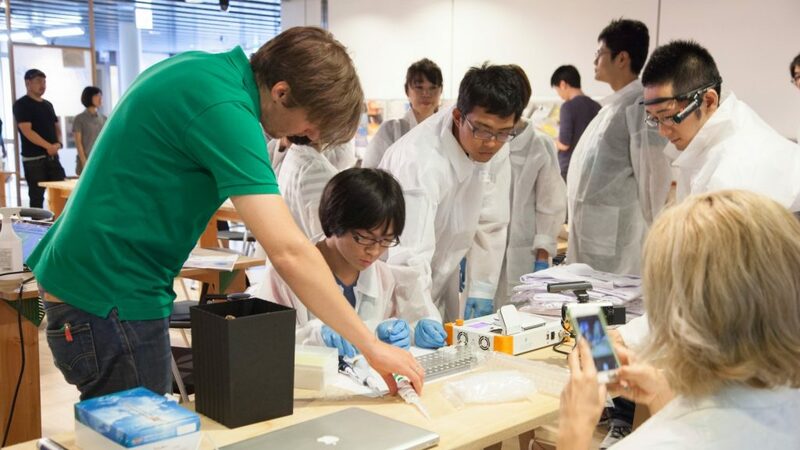 Over the course of three days, 30 participants, together with speakers, mentors and the YCAM team, explored the topic of personal biotechnology, conceptually, and in practical hands-on workshops, which also featured the use of 3 Bento Lab devices to prepare DNA samples for Nanopore MinIon sequencing. The first time I visited Yamaguchi, which is at the south-west tip of Japan’s main island, was in 2015. I came to YCAM to mentor a synthetic biology workshop as part of the bio-media art group BCL. This workshop was also the first time we tested our earliest working Bento Lab prototypes. Using the first working Bento Lab at YCAM in 2015, with BCL. 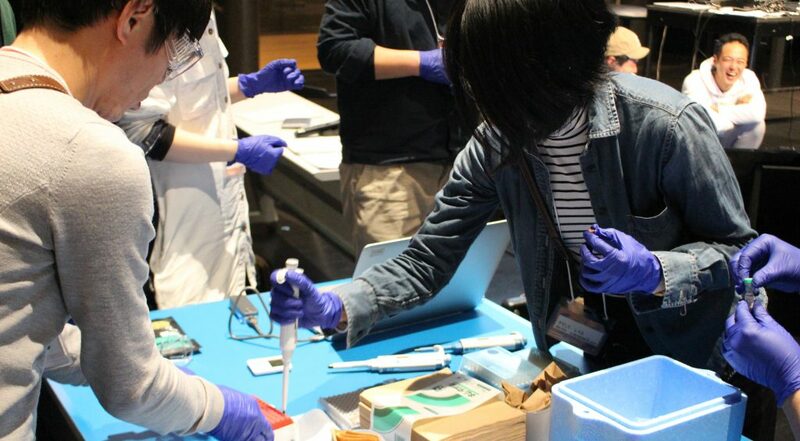 At the time, the team at YCAM was just getting interested in exploring bioscience as part of their media arts practice. Since then, the Bio Research team at YCAM has set up a dedicated wetlab and organised workshops such as Biotechnology from your Kitchen and a series of field trips called DNA of Forests which led to the creation of a botanical guide based on DNA analysis. The participants included visual artists, high school students, designers, a musician, an anthropologist, and a few reporters. 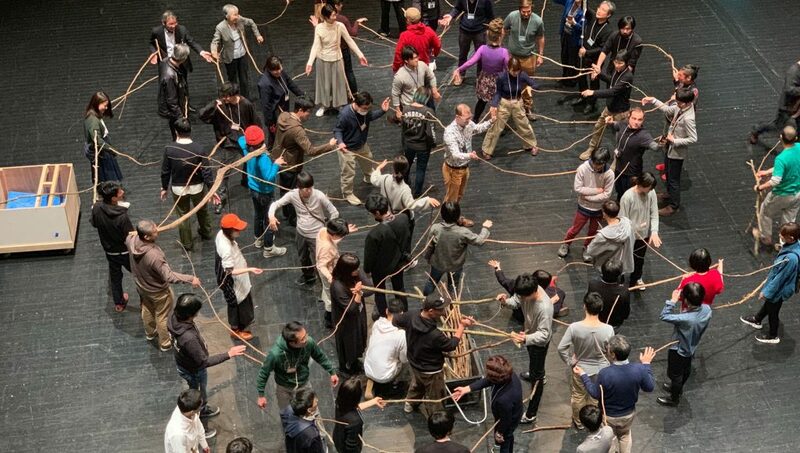 They were complemented by mentors and speakers, including Hideo Iwasaki from Waseda University, Sebastian Cocobia, contemporary dance art group Contact Gonzo, and also myself. The day started with extracting DNA from different vegetables, which included the use of Bento Lab’s centrifuge. 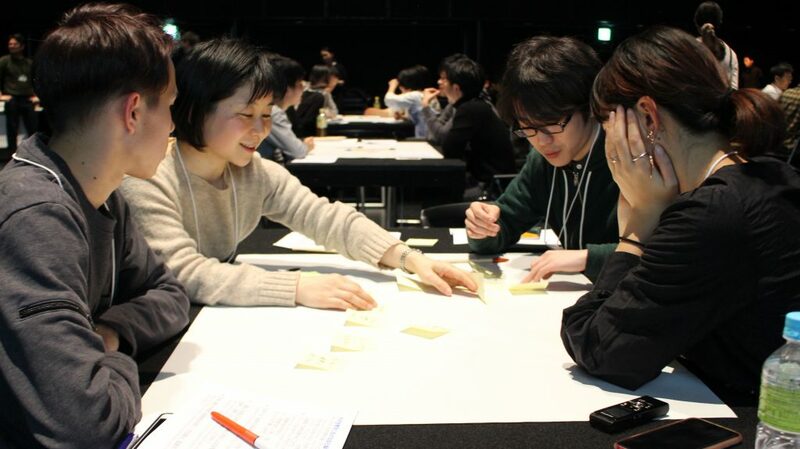 YCAM had set up three Bento Labs shared between the participants. The lab work was led by YCAM’s Kazutoshi Tsuda, who demonstrated each step. YCAM’s team also had a helper at each table, to make sure no participant was struggling. After the DNA samples were cleaned up, they were set up for PCR amplification using Bento Lab. While waiting for the Bento Lab units to perform the PCR run, it was my turn to give a talk about the origin, development and ethos on Bento Lab. The talk was going to be live-translated into Japanese, a first for me, which I had been feeling nervous about. Usually I speak quite spontaneously, but this time I had to talk for about two to three sentences, then pause to let the translator take over. However once I got used to it, I quite enjoyed this way of speaking, as it broke the talk into many small chunks, and each time the translator spoke I had a quick pause to consider how to best make the next point. KurAruK, one of the participants sketched her notes of the entire event, including the talk. After my talk and Q&A, the participants resumed the lab work. Using a nanodrop, they measured the amount of DNA that had been amplified. Fortunately, all PCR runs had worked very well, and everyone obtained good results. For the last activity of the day, each table was given a Oxford Nanopore MinION sequencer. Working in pairs, the participants set up the flow-cells to sequence the DNA they had extracted from vegetables that morning. The first day ended up being a marathon, and we finished after 9pm! The other mentors and I were amazed by the commitment and skill of the participants, many of whom had never handled a micropipette before. The second day and third days built on the “reading DNA” activity of the first day. First, Toshiaki Katayama of Biohackathon showed participants how to analyse the sequencing results of the previous night’s MinION run. The day continued with talks by Hideo Iwasaki and Sebastian Concobia. Professor Iwasaki is both a scientist (studying cyanobacteria at Waseda University and heading the Laboratory for Molecular Cell Network), and an artist working with biological media. He spoke about his journey as a hybrid artist-and-scientist and his personal home laboratory. I particularly like his piece aPrayer, which takes the Japanese custom of holding memorial services for laboratory animals, and expands the notion to synthetic cells. Sebastian Concobia, who featured alongside Bento Lab in a Do-It-Yourself Biology feature story of the Japanese newspaper Asahi Shinbun, also gave an inspiring talk about his quest to engineer a true blue rose in his home-based laboratory. The story of a young girl who used his lab to study the nutritional needs of Oxalis Stricta, a plant Sebastian was also studying, stuck with me in particular. She was testing optimal growth conditions of the plant for her school’s science fair, work which resulted in a growth medium for plant tissue culturing of the plant. On the last day, participants formed groups and worked on conceptual proposals that creatively reflected on the activities and topics of the workshop. After only a few hours of work, each team presented a short talk detailing their proposal. The results included a hilarious presentation on comparing laboratory rituals to the classical Japanese tea ceremony, to probiotic toys designed to strengthen children’s immune systems, to the idea of genetically engineering dogs to be able to drink alcohol – so they can be even better companions. A definite highlight of each day was the lunch – a specially commissioned lunch box called Genome Bento. Bento means “packed lunch” or “lunch box” in Japanese. 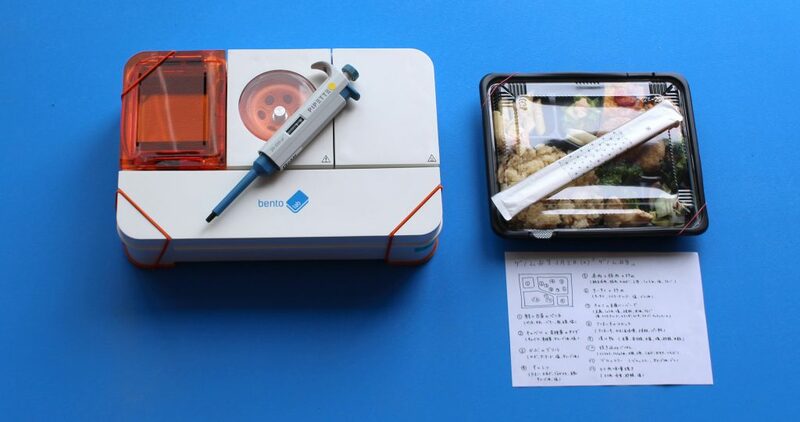 Each day’s Genome Bento was specifically prepared using only ingredients whose genome had been completely sequenced. On the last day, the lunch was provided as a Genome Bento buffet instead, with ingredients grouped by the year they were sequenced. It was one of the simplest and most effective ways of engaging with the notion of genetic information I have come across so far, and definitely the most delicious. Obviously Bento Lab itself is also named after the Japanese lunch box. Bento Lab is still a bit larger than the usual packed lunch, but not by much. 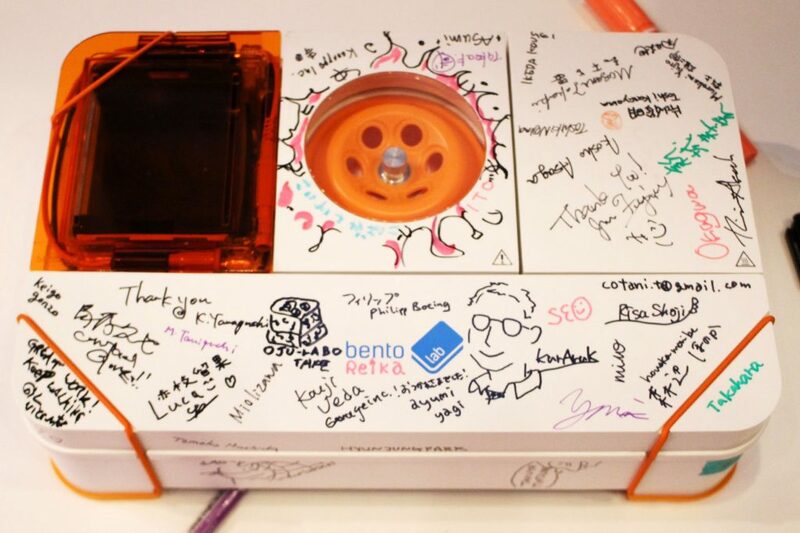 After the project presentations on the final day, YCAM’s Takayuki Ito asked all participants, mentors and staff to leave a mark on one of their Bento Lab units. What a simple and brilliant idea! Doesn’t the final Interlab-Bento-Lab almost look like a rock star guitar? Honestly, I was quite moved by the result. I hope it starts a trend! All of the workshop’s materials and protocols are on Github. 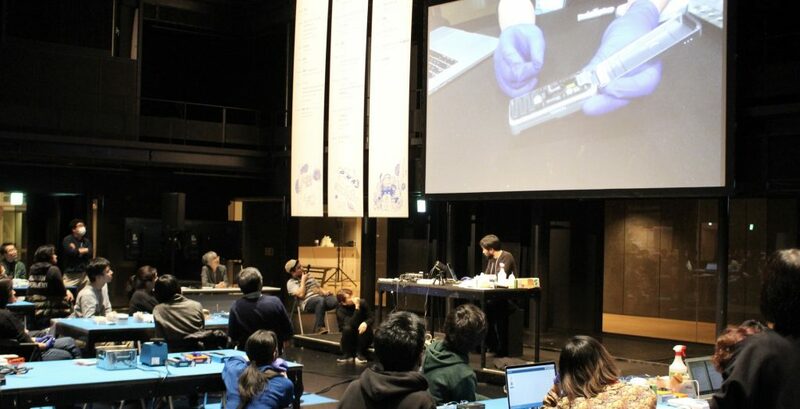 MakeMagazine Japan has also posted a great write-up in Japanese about Interlab Camp here. Finally, I would like to thank Takayuki Ito, Kazutoshi Tusda, Fumie Takahara, Kiyoshi Suganuma and Young-Ja Park for inviting and hosting me. I thought the workshop was an amazing achievement and I was honored to play a small part in it.